In the early twentieth century, photographers fell in love with "mass photographs," or pictures where thousands of people create one unified image. Often, at this time in history, the themes were patriotic and the participants were soldiers. Here are some of the most astounding. 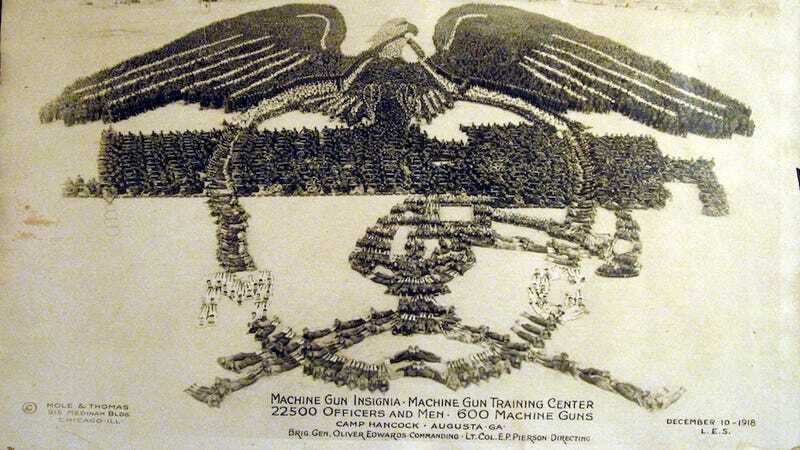 22,500 people and 600 machine guns, Camp Hancock, Augusta, Georgia – pictured above. Because there's nothing more American than tens of thousands of people posing with guns. 10,000 men of the 164th Depot Brigade at Camp Funston, near Fort Riley, Kansas. 18,000 people at Camp Dodge, Des Moines, Indiana. 12,500 officers, nurses and man at Camp Gordon, Atlanta, Georgia. 19,000 officers and men at Camp Lee, Virginia. The 2009 picture was taken at Camp Casey, South Korea.